There is only one positive thing that I can say about European Starlings and that is they are kind of pretty. They have black wings with an irridescent bluish green on their feathers with hints of purple around their neck area. Add some dots of white to this stocky bird and you have a nice looking bird. But that is it! You see I hate starlings! All other birds are welcome in my yard but not the starlings. They are very noisy with their high pitched raspy sounds that they make and all they do is swarm in to my feeders in large numbers and knock all the other birds out of the way. They poop everywhere! They are pests! 100 Starlings were first released in Central Park, New York City in 1890. They have grown to over two million birds spread from Alaska to Mexico. 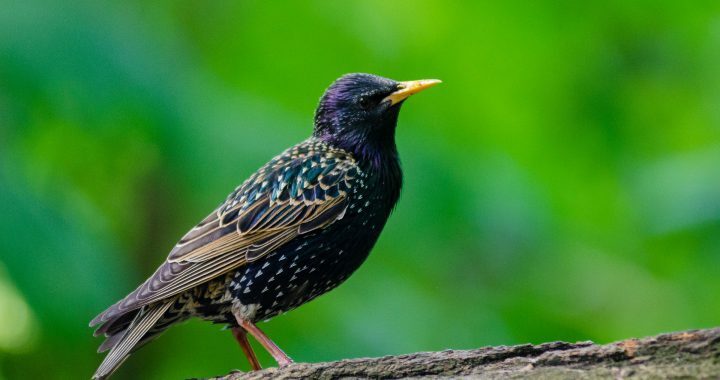 Starlings can imitate the song of up to 20 different species including the Eastern Wood-Pewee, Meadowlark, Northern Bobwhite and House Sparrow, Wood Thrush, Blue Jays, Red-Tailed Hawks and Cedar Waxwings. They can fly up to speeds of 48 miles per hour. Starlings eat nearly anything but focus on insects such as grasshoppers, beetles, and flies. They also eat fruits such as cultivated cherries, blackberries, and mulberries as well as grains, seeds, nectar, livestock feed, and garbage. Both the male and female incubate the nest. A migrating flock can number 100,000 birds. They roost communally in flocks that may contain as many as a million birds. OH MY! They sometimes flock with other birds such as the Grackle, Red-winged blackbirds, and Brown-headed Cowbirds. 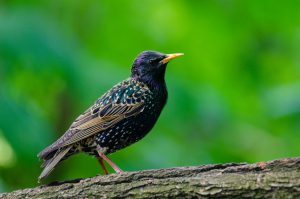 Starlings typically live around people, using mowed lawns, city streets, and agricultural fields for feeding; and trees, buildings, and other structures for nesting. They tend to build their nests close to other starling nests. One so close as 10-12 inches. Starlings often take over the nests of native birds, expelling the occupants and building their nest on top. See what I mean they are pests! FOOD: Starlings especially like suet, cracked corn, grains, and kitchen scraps so steer clear of these food items. They do not like thistle/nyger seed, and safflower seed. FEEDERS: You can purchase an upside down suet feeder as starlings have a hard time clinging underneath and tend to give up on it. There are also caged suet and tube feeders that many people also purchase for deterring squirrels and raccoons. They work pretty well. Also, keep the area clean underneath your hanging feeders as starlings will surely seek out the remnants. 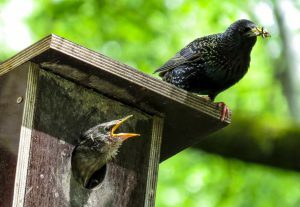 NESTING: Starlings make their nest in cavities such as a woodpecker hole, some type of crevice or a bird house. If you have bird houses in your yard just make sure they are smaller than 1.5 inches as starlings need it to be at least that size. 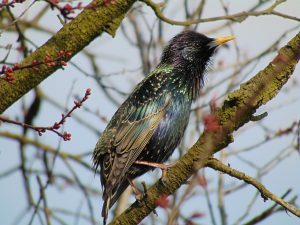 You can also remove starling nests as they are not protected in most areas. Their nests are made of loose twigs, weeds, grass, leaves, and feathers. They lay 4-6 eggs that are greenish or bluish white just so you know for sure it’s the right bird egg that you are getting rid of. 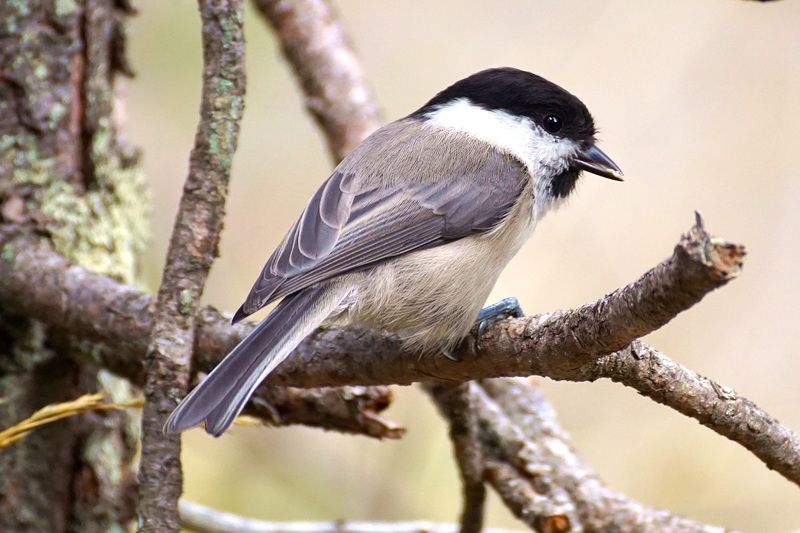 LAST RESORT: Take down your feeders, bird baths, and bird boxes for a few weeks to give the birds time to move on. No guarantees that they won’t come back but it is worth a shot. Don’t buy into the sonic devices or noise makers that you can purchase that are supposed to deter them. They may work initially but not for very long. The European Starling is not an easy bird to get rid of. I find that they are worse in the Fall and Winter as they are gathered in large groups during this time. Yes they invade my feeders too but I have found that they are not a daily nuisance. This is because I make sure not to have cracked corn in my supreme nut bird seed and because my suet feeders are difficult for them to hang on to. I never put out food scraps as this only attracts not only the starlings but also squirrels, raccoons, and opossums. Squirrels are not so bad but raccoons especially can be nasty. So keep all of this in mind if you wish to deter them from your yard. Have any thoughts about this? Please feel free to make your comments below. ← What is a Turkey Vulture?